Vision: The vision for this Art Auction is to be able to provide a platform for all the inspiring painters in Jakarta to showcase their talent. Through this auction, we also wish to inculcate the beauty of ‘giving’ and encouraging a buddy system between all the inspiring artists in Jakarta with all the differently-abled individuals in Saraswati Learning Center. We also want to create a feeling of togetherness and be “one community” by bringing in the underprivileged differently-abled students to come to school and obtain educational services. 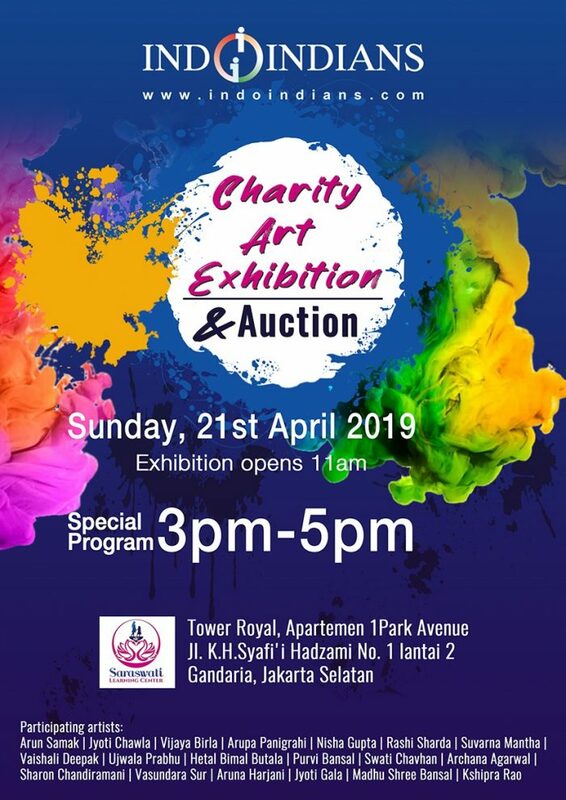 ‘The Art of Giving-charity art auction’ will bring together a group of painters who would like to showcase and sell their paintings at an art auction organized at SLC with the theme of ‘The Art of Giving’. The artists will come in as volunteers and be a buddy towards one child or a group of students at SLC which will be showcased and sold at the auction to raise funds for the less privileged special needs children. If the painters are not free to volunteer their time with the students, they can also choose to give a percentage of their profits made by selling their individual paintings. The joint paintings can have the students with the painters explaining about their painting and sharing their experience about working with the painters. Thus creating awareness about their abilities in the field of art. Thank you for your participation. The Registration is NOW Closed. On this day groups of children from SLC will perform on the stage set up by us. The people coming for the painting exhibition will also get to see the children performing. SLC with the help of our volunteers and teachers will also put up interactive stations for the children who come in with their parents on that day. The people can also interact with the vocational students to make bracelets, paint rocks with them. There will also be food and water station provided by SLC. We can also have a silent auction for all the paintings or have a call out loud for the paintings at the end of the program. Happiness Tips - Is it possible to really change at any age?